The black doe born last Friday got her name today. I fed late, because I wanted to catch a bunch of the sheep and goats in pens for shearing today. I discovered a baby lying flat on the ground struggling to get up. My first thought was that a goat had stepped on the baby, but I felt funny spots on the side of her neck, which really made me think snake bite. I grabbed the baby, gave her a dose of penicillin and put her in a basket, after feeding her some of the goat drench. If she was going to make it, she needed the energy boost. To tell the truth, I thought she was a goner. As the day went by, it became obvious that she had a chance, and I decided that maybe she had been bit by a different type of snake. 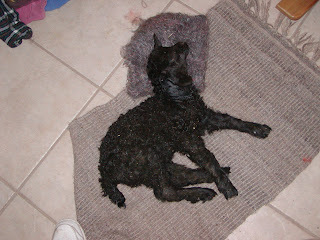 When Penny arrived to shear, we sheared the baby's neck to see if we could tell anything. (That was the only thing that Penny sheared today, because she was weaving on her feet and quite obviously sick. I sent her home. Push come to shove, I can shear, if necessary and no one absolutely had to be sheared.) We clearly saw two sets of bite marks. Another friend told me that the rattlesnake is the only snake that bites that way, so I knew what it was. He advised antibiotics directly on the wound. Marc and later Susan, a friend visiting from Patagonia, helped me milk the mom. I fed the baby a few times and then this evening went out to feed again. I have been keeping the kid in a box in a pen with her mom, so they keep each other company.Since the baby cannot get up and move, I did not want to leave her where her mother could step on her. I sat on the ground to feed the baby, thinking it was going to be another struggle.The mom started pushing the bottle in my hand and that baby started sucking. When she quit, I helped her stand and was amazed to watch her walk under her mother and proceed to drink. She was not very steady, but she has the will to live. I feel like I saw a minor miracle and that my day has been successful, although I have to admit that I have not accomplished much else! But, a live baby is a good thing.